Form Description: While you can take your chances and trust the information that your employer gives you in regards to your earned time off, it never hurts to keep track yourself. That is where this Vacation, Personal, and Sick Day Log can come into play. You can keep track of each day you worked, the time you earned, the time you have used, and the amount you have left. Definitely a huge help when you want to double check what you have earned. 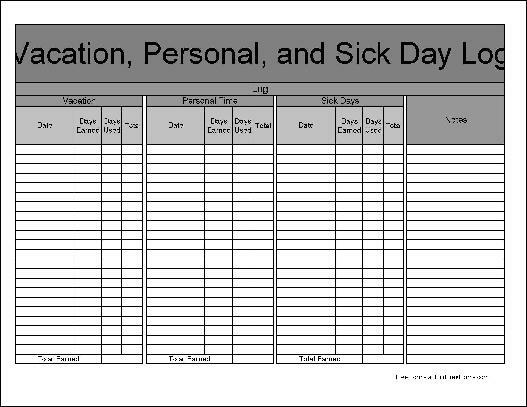 This form ("Basic Vacation, Personal, and Sick Day Log") is associated with the following keywords: vacation, tracking, log, personal time, sick day, time off, basic.